View White-tailed Deer hunting regulations for your county. A point is a projection that extends at least one inch from the edge of a main beam or another tine. The tip of the main beam is also a point. Find check stations and view CWD zones. Additional regulations may apply and additional zones may be established without prior notice anywhere in the state upon discovery of CWD. The department will make every effort to publicize the designation and location of CWD zones and check stations, as well as any special regulations that may be adopted following the publication of this notice. For additional or updated information see the CWD information pages, call any TPWD office or call 1-800-792-1112. A tag from the hunting license of the person who killed the deer or turkey must be correctly and legibly completed (including name of property and county) and immediately attached to the animal (exception is properties with issued tags such as MLD tags). See how to properly tag a deer. immediately complete, date and cut out the appropriate hunting license tag after a deer is harvested but before the deer is field dressed, moved or tagged. for white-tailed deer, immediately before moving carcass, complete the log, in ink, on the back of the hunting license. Asterisks in the log indicate bucks with an inside main beam spread of at least 13 inches. Failure to complete the log as required may result in a fine not to exceed $500 for each deer improperly logged. 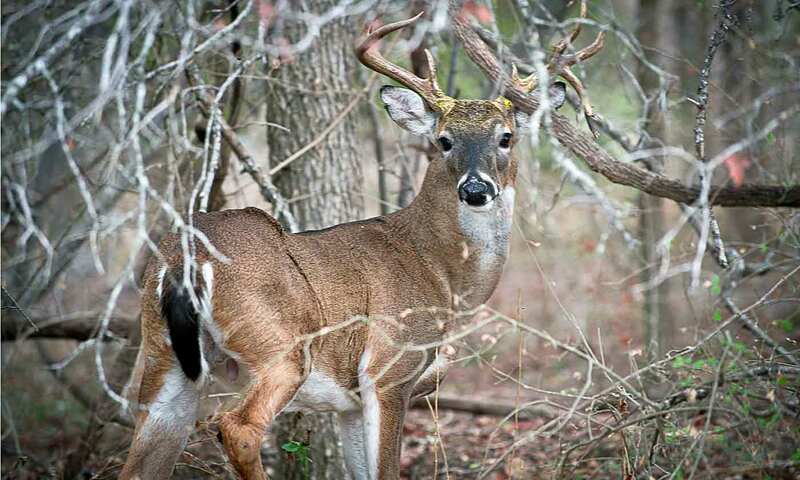 Completion of the log is not required for mule deer, or for white-tailed deer or mule deer lawfully taken under a MLDP tag, TPWD Special Drawn Public Hunt permit, or on a Big Time Texas Hunt. In counties with a Special Late Season, harvest is restricted to antlerless and unbranched antlered deer (a buck with at least one antler that has no more than one point). A point is a projection that extends at least one inch from the edge of a main beam or another tine. The tip of the main beam is also a point. Find your county to view hunting seasons. In Bell (E. of I-35), Delta, Ellis, Falls, Fannin, Franklin, Freestone, Hopkins, Hunt, Kaufman, Limestone, Milam, Navarro, Rains, Smith, Titus, Van Zandt, Williamson (E. of I-35) and Wood counties, the bag limits, requirements for the take of antlerless deer, and special requirements are the same as the period Nov 22-25 for each respective county (County Listings table, pgs. 82–97).